Title: Boston and Maine Railroad EMD GP40-2 No. 301, "Paul W. Cherington"
Description: THe D&H and B&M had run through power from Mechanicville to Oneonta, though sometimes the power would get to Binghamton or even farther, given the condition of D&H diesels. Most of the time, it was battered GP 9s, with GP 38s showing up from time to time. Today, this crew got lucky, drawing a set of spanking new B&M GP 40-2s, the last new power the B&M would get as an independent road. This train was a tough chase, especially on two lane NY 7-this was before I 88 was built-and this was the only shot I got of him. 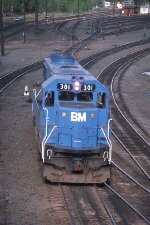 Title: BM 301 "Paul W. Cherington"
Description: EMD GP40-2 No. 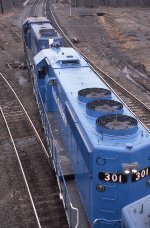 309 is the second unit in the power consist. Description: SEPO arriving at East Deerfield West. One of those "hazy, lazy, crazy daze of summer". Description: The B&M's slug set sitting outside East Deerfield shop when it was "brandy-new". Description: MEPO arrives at East Deerfield West behind the "standard" slug set of 300/100/301. Description: MEPO stretches out over the Connecticut River at East Deerfield East. Description: MEPO shoving a cut in to set off at East Deerfield East. Description: MEPO "motoring" through Montague interlocking. Description: MEPO going away at Montague interlocking. Description: MEBA (Mechanicville to Bangor) pauses in Greenfield for a crew change at 19:18. Description: After getting recrewed, MEBA shoves off at 19:23, with a friendly wave from it's new engineer. Description: MEBA proceeding through Greenfield East interlocking. Title: DH 7324, BM 301, 309, 207 on PYME-8. Description: Almost beat the crew member with the lantern!